I want to thank again well-wishers as I continue to recover from surgery. I’ve tried to maintain the daily presence of the blog during the past week because we have a readership that seems to engage it every day. Yesterday, however, I posted a piece that, when I read it back later, betrayed my true state: lingering discomfort exacerbated by the judgment-impairing presence of analgesics. The result was a post so badly written that it is a humbling reminder that a sincere commitment to a topic is never enough. I’ve gone back and, I hope, made it worthy of your time, but without any expectation that anyone would want to take it on again. However, I did so on the principle that it is necessary to get it right when introducing a new discussion thread, in this instance addressing the current political situation in Canada from a Frygian perspective. The “Harper government,” as it styles itself, has ambitions that are not consistent with our long tradition of the pursuit of good government. According to the old British North America Act, good government, along with peace and order, is not just desirable, it is a matter of constitutional concern. 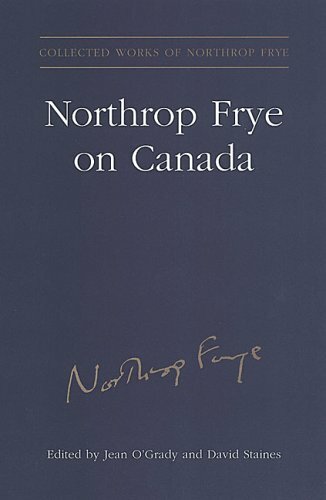 Frye regularly observed that we have a genius for political compromise that is unique to us. It seems to be foreign, for example, to an American political process that regards government with a suspicion that occasionally devolves into gun-toting hostility. For Canadians, government has never been something that gets in the way of national purpose, it is an instrument of it. The importation of “American style politics” by the Harperites is therefore not just a nose-tweaking provocation of our Red Tory sensibilities, it is an affront to our deeply ingrained sense of civility that has made us the world’s laughing stock as a pleasant enough but boring people. In other words, it undermines the best we have to offer. It’s hard to argue that Frye would have regarded it as anything but a quality worth preserving. Yesterday the Speaker of the House found the Harper government in contempt of parliament. That’s a welcome development but not much of a surprise at this point. Harper’s contempt for everything in the Canadian political tradition that does not deliver him to power has been apparent for a long time. What Frye has to say about the national character which shapes that tradition will increasingly become the focus of our attention here as the country moves toward an election. This entry was posted in Canada, Politics on March 10, 2011 by Michael Happy.